You might say that ‘my social media isn't that important'. Maybe that's true, but how important is your identity to you? What if someone else accessed your social media profile and started posting things you would never want connected with your name? Or, use your social media login to access other logins and accounts? Own your social media presence – download the infographic from Stop.Think.Connect. Whenever you have an opportunity to use two-factor authentication, consider this option. Two factors include something you know, and something that you have. However, if you use your existing social media account (for example, Facebook) to leverage access to another account (for example, Amazon) your activity associated with your Facebook account might also be tracked to your next Amazon purchase. Some applications or on-line accounts offer two-factor authentication. The account login procedure will automatically generate a random one-time verification code (often a 6 digit number) that is sent to the smart phone that you have registered with your account. You may need to download a two-factor authentication app to your mobile device. (Examples: Google Authenticator, Authy, Authenticator Plus, and others). Maybe. Remember, social media isn't about advertising – in fact, using social media just for advertising is a very weak strategy. Social media is about creating a strong digital presence and building relationships – with your clients, with employees and new recruits, and with other colleagues and allies in your field. It's about stirring conversation and debate, and positioning yourself and your company as experts. In short, it's an incredibly valuable resource, if you use it strategically. If you decide to use social media in your business, you need clear rules about who will authorize messages. You also need a strong social media policy to provide direction and education to your employees about what they can – and can't – say on-line. Are You Trying to Run a Successful Healthcare Practice Without Using Social Media? Do you want more tips and resources like these – for FREE? Join us for the Free 15 Day Privacy Challenge for more tips, tools, and templates that you can use right away! 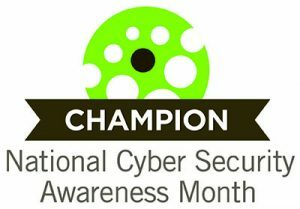 We are proud to be a Champion of National Cyber Security Awareness Month #CyberAware. #15DayPrivacyChallenge. Do You Want Shorter Wait Lists? Join us for the Practice Management Nuggets Webinars for Your Healthcare Practice interview with Hernish Acharya of Cancellation Spot! Hernish Acharya will show you how you can quickly contact the correct patients already on your waitlist to fill that last minute cancellation. The replay is available for a limited time only! Do You Want to Take Back 30 Minutes in Your Work Day? If you work in a healthcare practice of any kind and fill open appointments after receiving a cancellation, you need to watch this webinar. Register for the FREE 30 minute webinar and improve your cancellation management right away! Worried About Inaccurate Health Information Online? Join us for the Practice Management Nuggets Webinars for Your Healthcare Practice interview with Carol Bush, The Social Nurse! Carol Bush, The Social Nurse, knows how to create healthcare content that supports your healthcare practice. Practical Business Blogging Tips for Busy Healthcare Practices! then this free 30-minute Privacy Management Nugget Webinar is for you! • Why should a private practice blog? • Why get serious about blogging? • Ideas for your blog. Practice Management Nuggets’© series is hosted by Jean Eaton (Your Practice Management Mentor) of Information Managers Ltd. Worried About Inaccurate Health and Medical Information Online? Your patients want information right away – and will use Dr. Google to get it. Instead, wouldn’t you rather that your patients had access to the right information for them, just in time, that was meaningful, accurate, and reinforces the key education that you want to achieve? You have a lot of information to share with our patients – but you don’t always know how to share with the patient after they leave the exam room. Consider creating your own blog! You are an expert in your healthcare practice. You have the knowledge to share with your patients and clients. Make your story authentic and unique. Ideas for content in your blog is easy! The whole team can share stories! Accounts, front desk, nurses, social workers. Start with the top questions from your incoming phone calls. This is information that your current patients and clients want to know. Create a blog and post it to your website and then to social media. You don’t have to learn the technology. You can make this harder for yourself, but why do that? There are many cost effective options to make this easy. Identify a wordsmith on your team and support them with coaching or completely outsource research and content production. Why should a private practice blog? Why get serious about blogging? Tips to support your wordsmiths. Carol Bush is a writer and content strategist. She is the founder of The Social Nurse, a consultancy helping healthcare small businesses and Nurse Entrepreneurs tell stories that matter to the people they need to reach. 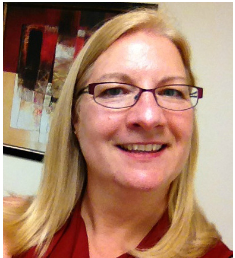 She is a contributing writer for allnurses.com and an editorial advisor for Oncology Nursing News. Carol is the Co-Founder of Healthcare Marketing Network. I'm sorry – that replay has expired. Are you a member of the Practice Management Success? You can access all the replays from your membership account! We're under construction moving to a new membership portal to improve your membership experience! You get FREE ACCESS to Practice Management Success for a Limited Time! Hurry! Enjoy all the free content as it gets added to the membership portal. Once we're done with the move, your free membership will close! Yes! I want FREE access to Practice Management Success for a Limited Time! To attend the next Practice Management Nugget Webinar, select the webinar and register for the FREE webinar. The perfect lunch break for busy practice managers – only 30 minutes and it’s free! Practice Management Nuggets Webinars is a weekly interview series with practice managers, healthcare providers, or trusted vendors who support healthcare practices. Topics include things you need to know to help you start, grow, fix, or maintain your healthcare practice. The events will be short – about 30 minutes – with nuggets of information that you can use right away. And best of all – this is a free, no cost opportunity for you and your staff to hear from experts on a variety of topics how they made their clinics and businesses a success! Register now to receive a weekly update of the Practice Management Nugget Webinar guest speaker. Even if you can’t attend register anyway and we will send you the replay. Replays will be available for only a limited time. I want weekly reminders of upcoming guests! What Keeps Community Pharmacists from Using Social Media? Join us for the Practice Management Nuggets Webinars for Your Healthcare Practice interview with Saam Ali, The Pharmacy Mentor! Saam knows that pharmacists can use social media to help drive your sales, increase brand awareness and strengthen relationships in your community. 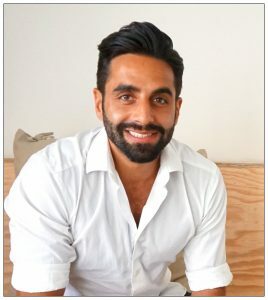 In this 30-minute Privacy Management Nugget Saam Ali will give you 3 valuable tips on how to use social media. Patients get to know, like and trust your pharmacist. Easy to implement – you don't need a lot of technical skills. Save money compared to traditional marketing strategies. Would you like your patients to understand all the services that your pharmacy offers? Would you like more loyal, repeat patients? Would you like more new patients? Would you like more sales in your pharmacy? Would you like all of this without spending a fortune? Saam Ali is a locum pharmacist in Britain with more than 10 years of experience working in a variety of roles in the community, ranging from running daily private clinics to managing pharmacies with multi-million-pound turnovers. However, for the past 3+ years, he turned his focus to the technology and online sector. During this time, he has become a proficient website developer, expert video course creator and founded a successful online company. The primary way he grew the company was by marketing through Social Media and it's his experience and understanding in this field that has led him to build this innovative course for the Independent Pharmacy sector. Today, he continues to work part-time as a locum, consults with Pharmacy Businesses around innovation, but spends most of his time creating digital content to help drive Community Pharmacy into the digital age. Register for this free webinar here. You will be re-directed to the replay right away. Along with your registration for the event you'll also benefit from weekly email reminders of the next guest expert on Practice Management Nuggets Webinars for Your Healthcare Practice. Practice Management Nuggets Webinars is a regular interview series with practice managers, healthcare providers, or trusted vendors who support healthcare practices. Topics include things you need to know to help you start, grow, fix, or maintain your healthcare practice. The events will be short – about 30 minutes – with nuggets of information that you can use right away. If So…You Don't Know What You're Missing! Click the >> Arrow above to play the webinar right away! Myth #1: If I don’t use social media, nothing bad will happen. Myth #2: I need to hire a full-time advertising agency or social media strategist. Myth #3: I can’t engage patients in social media in a way that doesn’t break privacy rules. Let Janet show you how you can use social media for your small healthcare practice – even if you have never used social media before! Patients need information all the time – and it is far better that they get their information from you, their healthcare provider, than other less reputable sources on the internet. It’s not that hard – when you have a process that makes it easy to provide the information to your patients. Janet M. Kennedy of Get Social Health Academy will show you how you can make this easy with your limited resources. Watch the replay of my interview with Janet M. Kennedy, creator of Get Social Health Academy. 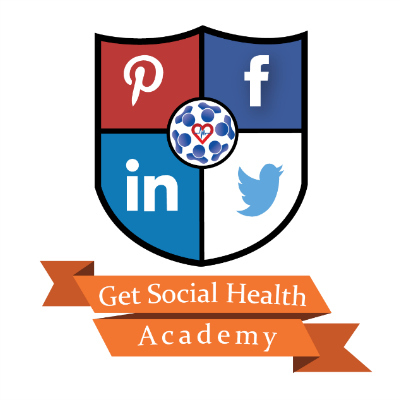 “Healthcare Social Media Training” Self-Directed Online Courses in Social Media and Marketing for Healthcare Professionals, Practices, and Community Health Organizations. If you know your healthcare practice should be found on-line – but you don’t know how, and you don’t want to hire a full-time marketing person! If you think that you could really help your patients with your tips to keep them motivated – I want you to have this program! If you know that you have a great healthcare practice and that you can provide great care and services to more patients – if only they can find you online! – then I want you to claim your online presence and get new patients through your door! 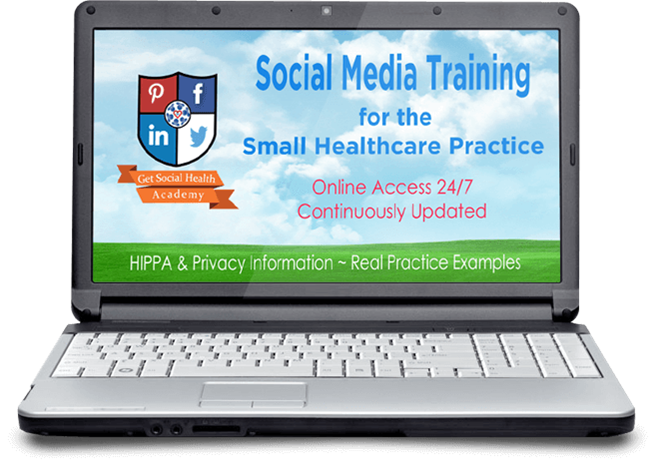 Healthcare Social Media Training is ready for you today! 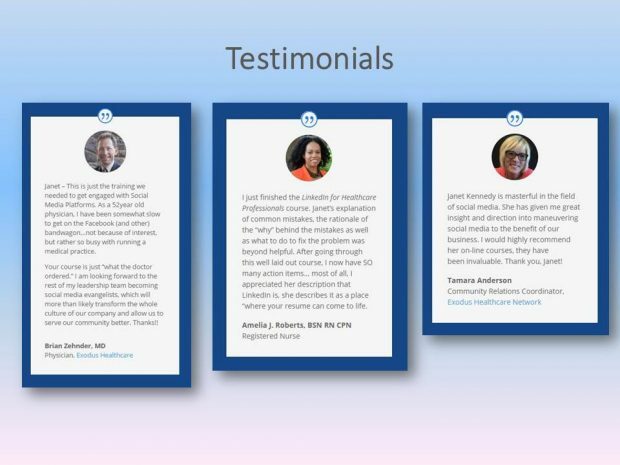 Janet Kennedy has created on-line courses specifically tailored for the healthcare practice or organization with limited marketing staff or budget. If you don’t have a full-time marketing manager on your team, or if you’ve delegated social media management to a team member with limited professional social media experience, then you need to attend this FREE Webinar with Janet M. Kennedy. Social Media cannot be ignored any longer by healthcare professionals. It is being used in some way by the majority of patients and is becoming “business as usual” to many. To the small healthcare practice it can be a concern as there is a lot to learn. Hiring an advertising agency or social media strategist is not a feasible solution for many smaller practices. Healthcare providers and practice managers don't have the time to learn everything about many different social media platforms. Myth #1: If I don't use social media, nothing bad will happen. Myth #2: I need to hire an advertising agency or social media strategist. Myth #3: I can't engage patients in social media in a way that doesn't break privacy rules. And Jean will be there, too, on the webinar and in the private course discussion groups to learn with you, brainstorm, and comment on your questions. Participating in social networking and other similar Internet opportunities can support physicians’ personal expression, enable individual physicians to have a professional presence online, foster collegiality and camaraderie within the profession, provide opportunity to widely disseminate public health messages and other health communication. Get up to speed on social media for your healthcare practice, watch the webinar now! If you have been thinking that you should start or improve your Facebook, Twitter, LinkedIn presence, help patients find your practice and be recognised in your local community as the go-to healthcare provider but didn't know how to get started–now you do! Attending a professional conference and want to have a richer experience? New to Twitter and not sure how to use it effectively? 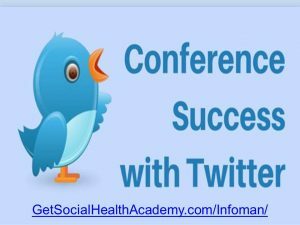 Sign up for a free online course Conference Success with Twitter! Course Value: $47 but sign up for free! Are you ready to take control and manage social media with Janet and Jean? Janet Kennedy is a 20+-year marketing and social media professional and is the Host of the “Get Social Health” podcast sharing best practice stories and interviews about social media in healthcare. Janet has interviewed medical futurists, healthcare practitioners and ePatients, digital health advocates, and entrepreneurs. This webinar is hosted by Jean L. Eaton of Information Managers Ltd.
"The 15 Day Privacy Challenge has given me some additional information on day-to-day responsibilities that I hadn't considered until now. Each Privacy Challenge has been so informative and I've been sharing it with our office staff."